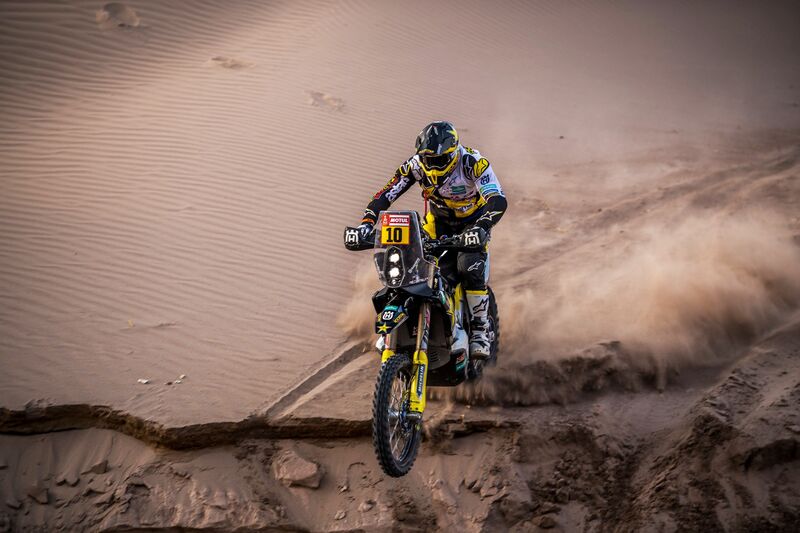 Battling through yet one more demanding stage at this year’s Dakar Rally, Rockstar Energy Husqvarna Factory Racing rider Pablo Quintanilla has climbed one step higher in the event’s provisional overall standings. With only tomorrow’s last stage remaining, the Chilean rally star is currently placed seventh overall. Bringing competitors to the last bivouac of the 2018 Dakar Rally in the city of Córdoba, Friday’s stage 13 was one of the longest in this year’s event. Featuring two separate timed specials, it proved to be yet another long and exhausting stage in South America. Unable to show his full potential, Pablo wrapped up the day in 12th position. With one shorter stage still to be contested tomorrow, the Chilean will do his best to wrap up this extremely demanding two-week-long adventure on a high note. For Pablo’s Rockstar Energy Husqvarna Factory Racing teammate Andrew Short, stage 13 proved to be challenging. Crossing the finish line of stage 13 in 37th position, the US racer remains 17th overall. Andrew now has his eyes set on crossing the big finish of his first Dakar tomorrow. Following thousands of racing kilometres, the 2018 Dakar Rally enters its last competitive stage tomorrow. With competitors following a circular route north of Córdoba, crossing the finish line in one of the most challenging Dakar’s in recent memory will be a huge feat for all those who will make it home.